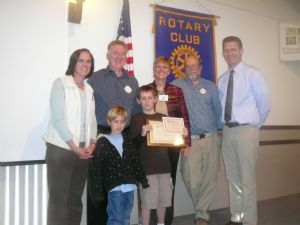 Kevin Taylor was honored as Student of the Month at the April 7 club meeting. Kevin is in 5th grade at Lake Forest Elementary School. He was selected for his leadership in helping other students in his class. Left to right, front row: younger brother Ethan and Kevin; back row: parents Caroline and Steve Taylor, Rescue Union School Distrist Superintendent Carol Bly, 5th grade teacher Rob McClurg and Lake Forest Principal Bruce Peters.